Well, AMC was showing “Top Gun” last night and Mrs. E. had “parent’s night” to attend, sooo… Not really a great movie. “Saw Top Gun” said Spiff over the phone. Soon after, Spiff served for eight years aboard a boomer. Must of been one of the greatest recruiting vehicles of all time. It was peacetime… . Come on! you’re protesting right about now. This is about the search for an Easy and Elegant Life, remember??? 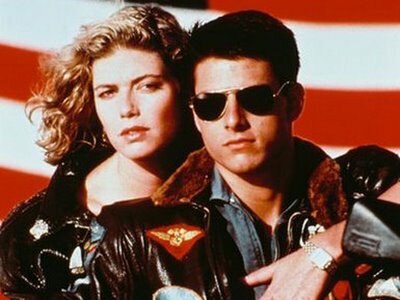 O.K. . There’s something else “Top Gun” teaches us… That classic style never goes out of fashion.. Look at Kelly McGillis’ wardrobe… dated. Look at Tom Cruise. Stepped out of the magazines. Why? Leather flight jacket. Razor cut hair. Aviator sunglasses. Some things are eternal and when you feel the need to invest in something, stick with the classics. You’ll look as good years from now as you did when you bought them. Other than that? Stick with your wingman this weekend and don’t forget the rules of engagement. 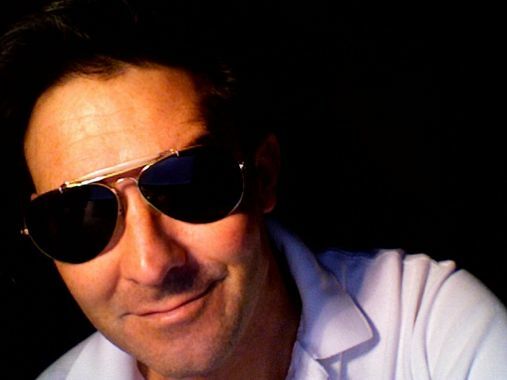 This entry was posted in Elegantology and tagged Kelly McGillis, Ray Ban Aviators, Tom Cruise, Top Gun. Bookmark the permalink. I just received a pair of the model of Ray-Bans you’re wearing (with a smaller lens size, it looks like.) With the plastic forhead bridge (or whatever it’s called), they are the “Outdoorsman model” – mine have cable temples and I plan on wearing them pheasant hunting this November. I think Cruise is sporting the classic avaitor model (no plastic forhead bridge). The most flattering garment a man of any stature or age can wear is unquestionably the aviator, flight, or Eisenhower jacket. They get better with age. EVERY major design house has appropriated this look…Ralph Lauren, Mugler, Gaultier, even Hermes. The best versions are still the American and British original versions, some of this still made by the original manufacturers, such as Schott, decades after the originals of W.W. II. Rarer than the dark brown are the paler, blonder versions. Schott made them on and off and in limited numbers…sort of the equivalent of faded versus new Indigo jeans. Glad to see your 1988 aviators have survived. Have a great weekend! Now while I am an advocate for classic, timeless looks, there is, and must needs be, some room for trends or for wearing some things that are “in the now”. Why? Because some things look great but are only acceptable now. If you do not capitalize you miss out. Just look back, some looks of the 20’s or 30’s are fantastic but if you try it now you run the risk of being mistaken for a movie extra rather than being taken seriously, or taken stylishly. If you like something I say incorperate it or risk missing out as the fashion winds blow the boat to other shores. Hello Brohammas, I’m not much on fashion. But my skinny 60’s ties are back in. You’re going to see bomber jackets on the runway this season, I’m sure. They’ll be cut on the slim side… just like the real deal. I’m shooting for more permanent style rather than fashionable. But that’s just me. Doug in OK. I’ve still got my tortoise shell Wayfarers from the early eighties, too! SWF, I’ve got a Vietnam vintage Navy flight jacket that is just the thing for open top rides in fall. Bought it on eBay for next to nothing. Hello EHR, actually, those are the small size. I’ve got a pinhead. The plastic bar is supposed to keep sweat from dripping into your eyes. Mine have cable temples too, to help keep them on my nose during the aforementioned perspiring. I don’t think they’d fit under today’s flight helmets, which have tinted visors to deal with glare anyway. I LOVE Top Gun… I have my own personal copy. And although I disagree with you about the movie, I do agree completely about TC’s fashions in it. Some of my fondest childhood memories were of running down to the flight line (we lived on base) to watch my Dad land his jet, hop off nonchalantly, and stride toward me grinning in his aviators and gray-green flight suit, upon which, one night, I had stitched a tiny red cross. He was such a cooool dad. M. Lane…. my guilty pleasure is “Navy SEALs” with Charlie Sheen. HOOYAH! DD, oh my… an aviator’s daughter. Others find it hard to measure up… . Lucky that you got to see him on perfect three points. Wish that I could find my old RayBan Aviators. One of my business partners is a former USAF Thunderbird team pilot. His collection of vintage aviators and other cool sunglasses is enviable. ADG, check eBay…. unless your colleague has beaten you to the punch.